Successfully Added Intel 945G Express MicroATX Motherboard to your Shopping Cart. 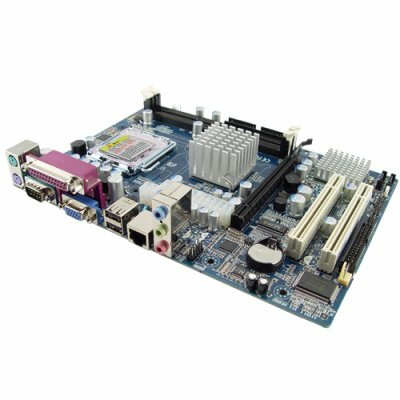 Powerful yet affordable Intel-based Micro ATX motherboard that combines performance and economy for desktop computers used in the home or office. With all the mainboard choices out there, it's easy to be overwhelmed and just buy a completed system. Aside from overpaying for convenience, you get a lot of what you don't want or need. This unit is for those people who need a new motherboard or just want something reliably powerful without breaking the bank to build an awesome system around. Versatile enough to meet home or office computing demands, this mainboard's support for the recent Core2 Duo processors and backwards compatibility with most other Intel CPUs means you can build a variety of systems based on your computing demands. Furthermore, given the cheap availability of memory these days, load up this unit with up to 4GB worth of RAM and you're good to go for pretty well any application you have in mind. And given all the electrical devices in use today, you'll be happy to know that this motherboard supports up to 4 USB ports. You can easily power your iPod, wireless laser mouse and keyboard, wireless and Bluetooth adapter, external hard drives and assorted USB peripherals without the hassle of unplugging and plugging USB's to make room for them all. Now for some surprises: built into this motherboard is Intel Graphics Media Accelerator technology. In plain English, you can watch HDTV with this motherboard and you can even use two monitors at the same time for when you need to keep one eye on work and one eye on the stock market. How cool is that?! The CVFW-CH05 is a versatile winner with everything you need, and a few pleasant surprises along the way. Just the first in what promises to be a long lineup of best value on the market motherboards from your source for wholesale direct from China electronic products, Chinavasion. Intel-based Micro-ATX motherboard based on the Intel 945G Express chipset. Compatible with many generations of Intel processors. Ready for up to 4GB of RAM and two HDD's (hard disk drives).